Cuba has been a melting pot of cultures, especially those of Spain and Africa. In addition to the natural beauty of this Caribbean country, many tourists come here to immerse themselves in an experience straight out of the 1940s and 50s. Old American cars, the crumbling houses and narrow lanes of Havana. And of course, its rich tradition of music, dancing, cigars, cocktails and cuisine! Note: Picture of Havana Market above courtesy Marian Reid in Go Travel. Havana's La Bodeguita del Medio, made famous by Ernst Hemingway, has long been known as a wonderful gathering place for cocktails, cigars, and the local cuisine.The Palo Alto namesake opened in 1997 bringing the unique tropical atmosphere, Cuban specialties, rum-based cocktails and cigars right here to the Silicon Valley. Complementing the cuisine is a collection of original Cuban artwork which creates an environment that is very charming indeed. The location at 463 California Avenue in Palo Alto is halfway down the block (the English translation of the restaurant's name is 'the bar in the middle of the block'). The restaurant with its banana-yellow walls also boasts of a cozy cigar divan and a patio out back for that moonlight smoke. 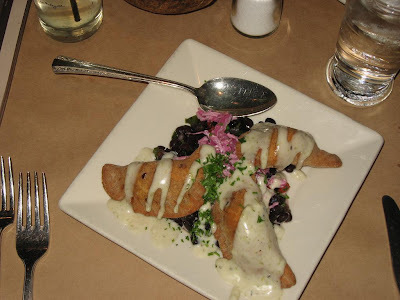 We began with the highly recommended Ceviche and Empanadas. 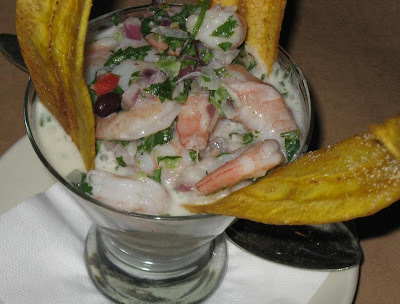 The Ceviche of house-cured shrimp, key lime juice, coconut milk, black beans, cilantro, peppers wonderful. The Empanadas of shredded picadillo pork, roasted chilis, pepper jack, cabbage salad, coconut-roasted jalapeño sauce was impossibly light, non-greasy and awesome too. 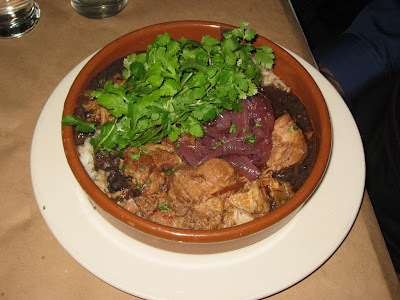 The Masitas of spicy roasted pork, white rice, black beans, cilantro, Rioja carmelized red onions were perfect too. Well marinated and flavorful to the last morsel! The eclectic Tierra y Mar is a combination of very tender, juicy skirt steak combined with three giant, coconut-crusted tiger prawns on the plate. 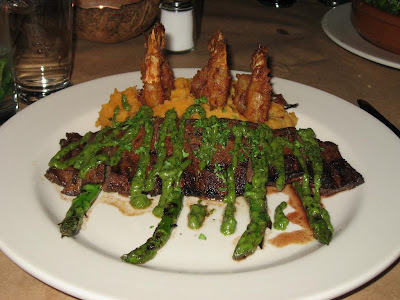 The sofrito mashed potatoes and avocado-cilantro pesto completes this wonderful dish. After all that delicious food, we didn't really have space for more. However, having heard about the great desserts here, I had to order one tonight. The Flan infused with Santa Teresa orange rum was a fitting end to this exceptional dinner. Tonight, everything on the table exceeded my expectations. No wonder this place is still very popular after all these years. I tried two different cocktails during the evening. Hemingway's favorite Mojito was very good: Bacardi limon rum, mint, sugar, fresh citrus juice and a splash of soda. The Hemingway Cocktail made of Bacardi limon rum, maraschino liquor, fresh citrus juice, and sugar served straight-up in a sugar rimmed martini glass was sweeter - I would recommend the Mojotos over this one. Was the food authentic? The answer is no, and is not intended to be faithful to the island's hearty meat-based Criollo cooking. However, the use of exotic fruits and vegetables such as yucca, plantain, and papaya, with emphasis on seafood and the inclusion of one or two indisputably traditional dishes do reflect Cuban tastes. Above all, the chef's subtle way with citrus flavorings and spices is completely Cuban too; although one of the hottest chili peppers is named for Havana, island food explodes with flavor, not fire. 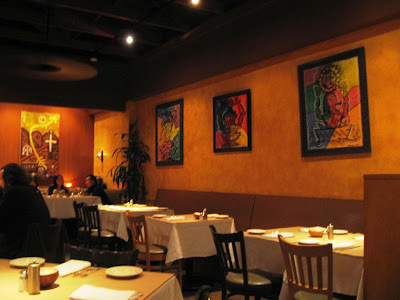 Combined with the unpretentious ambiance and good service, La Bodeguita is an excellent dining option. The Post Gazette points out that the Hemingway craze is now popping up in bars with Cuban themes from Mexico to Paris. 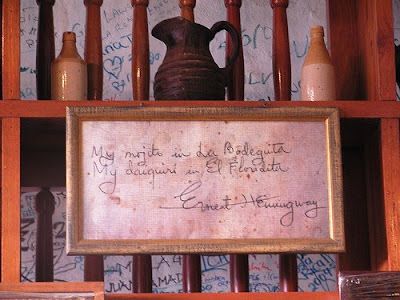 Most of these La Bodeguita del Medio bistros display the replica of a handwritten note Mr. Hemingway wrote years ago, paying homage to two Havana bars where he battled writer's block with alcohol. "My mojito in La Bodeguita del Medio, my daiquiri in El Floridita," reads Mr. Hemingway's endorsement across a paper napkin. What a wonderful gourmet guided trip in a wonderful place. I've always wanted to go to Cuba so thanks for taking us with! As a Norwegian, my fave would of course be house-cured shrimp. 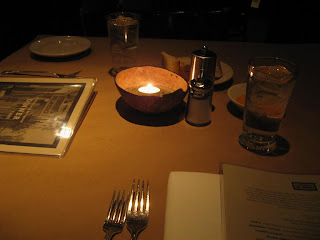 Your blog is amazing.. Photographs and the info go hand in hand.. I should never visit your blog before lunch. I am drooling all over the place. I love ceviche, but never had it with coconut milk. Who cares if it is authentic as long as it is tasty. 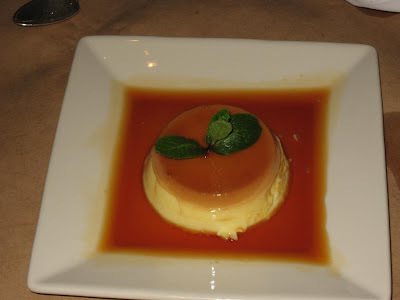 I had authentic Cuban food in Key West it was just ok. Their flans are always the best. The pork and rice looks mouth watering. I have never had Cuban cusine, so now I know what to have whenever I do! I hope to go there this year..! @RennyBA: I guess seafood, including raw fish, does have an important place in Norwegian cuisine too. @Ruminations: Thank you and welcome here! @Vamsee: So they tell me. :) Agree about the flan. @Aathira: I haven't come across any in India yet. @Final Transit: You have been busy. Good to see you back here. im extremely hungry now, Shantanu and thirsty too...all that I feel like saying is Cheers ! I'm fascinated about Cuba, and this post was of special interest to me. Thank you for sharing. sorry to say but tha saga of hemingway and bodeguita is a fake ! hem never used to visit bodeguita and never to drink mojito... his local was floridita and his drink daiquiry... and the slogan "ma mojito etc...." is a fake too... written from a graphic artist after the dead of hemingway !